The J.D. Williams Library offers complete wireless coverage for patrons who wish to use laptops or other mobile computing devices. 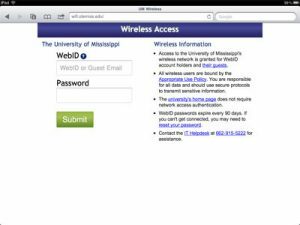 All you need is your Ole Miss WebID and password. Visitors who do not have a WebID can pick up guest login instructions at one of the service desks. When launching your browser from a wireless device you will see the below screen, prompting you to enter your WebID and password. Upon submitting your WebID and password you will be connected to the wireless network. If you have further questions please refer to campus wireless networking. The library also provides a wireless printing system for laptop users. You can use this system to submit print jobs through a web form, and no software will be installed on your computer. For a more detailed over view and set of step by step instructions, see our wireless printing page. If you need any assistance, please contact the IT helpdesk at 662-915-5222.